Driving along the west coast of South India is always an exhilarating experience. The restless rolling breakers of the Arabian Sea cast a hypnotic spell on anyone who stops to stare. From Mangalore, I travel south towards Kerala. My destination is the historic Bekal Fort in Kanhangad. Buses are frequent, cheap and comfortable. There is a distinct change in scenery as one moves from South Kanara into Kerala. Petrodollars from the Gulf have transformed the rural scenery into concrete jungles,houses with monstrous facades and gaudy distemper, mannequins in shop windows draped in sequined silks, gold jewellery dazzling through glass enclosures, stately mosques and serene madrasas! But amidst these changes are familiar figures of hawkers with mundus hitched high, revealing hairy muscular thighs, and wiping their sweaty faces on towels draped across their shoulders. They stand beside mounds of tender coconuts or sturdy yellow nendrakai, beckoning passers by. The aroma of brewing coffee and spongy neyappams from the way-side eateries, waft through the air. I get off at Kasaragod, though there are frequent bus services to Bekal Fort. I prefer to take a taxi for the 25 kms ride to Kanhangad, because I'm not sure of the way. From a distance I see the 500-year old giant fortress standing on a hillock. From one angle it appears to rise up from the sea. Most of its external wall is battered by waves at high tide. A sturdy battlement called Sunset Tower juts into the sea, overlooking dark treacherous rocks that stand like ossified behemoths, against the pounding of the waves. was used exclusively for defence. There are no palaces inside. But there is an Armoury, and an underground tunnel that leads to the sea. There must be many more such tunnels. But they have now been blocked off. The Archaeological Survey of India has done a good job of repairing the walls and constructing a walkway along the periphery of the Fort. It has also laid out beautiful gardens inside the Fort. There is a Blood Pond in the garden, into which two treacherous sisters were pushed to their death during the time of Hyder Ali. Bekal has a long history. It acquired maritime significance in the 12th century under the Perumals. In 16th century, the feudal Nayakas of South Kanara attacked and annexed it. 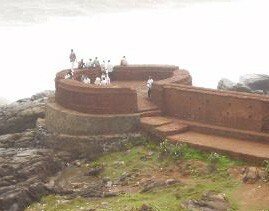 They built several other forts in Kasaragod district. In the 18th century, Hyder Ali captured it and used it for his military expeditions. Later, it came under the possession of the East India Company. Since 1956 it has become a part of Kerala. A Hanuman Temple and a Mosque outside the gates of the Fort bear witness to the religious harmony that existed in those times. Unfortunately, this strip of beach near the Fort is not safe for swimming. But just a kilometer away is the Aqua Park with water sport facilities and pedal boats. The Kappil Beach is five kms north of Bekal. Its silver sands and friendly waves make it an ideal picnic spot. About 10 kms north of Bekal is the Chandragiri Fort, which is an ideal "get away." It has many nice places for picnics, and motor boats to ride up the Chandragiri River. About one km south of Bekal is the Pallikere Beach, a tranquil stretch suitable for sea bathing. As I stand on the rampart of the Bekal Fort , Man's ingenious creation, and look towards the blue expanse of sea, I recall the words of Proctor, "The sea, the sea, the restless sea- the blue, the fresh, the ever free!" Regular bus services between Mangalore and Kanhangad. Handicrafts showroom and exhibition Centre.